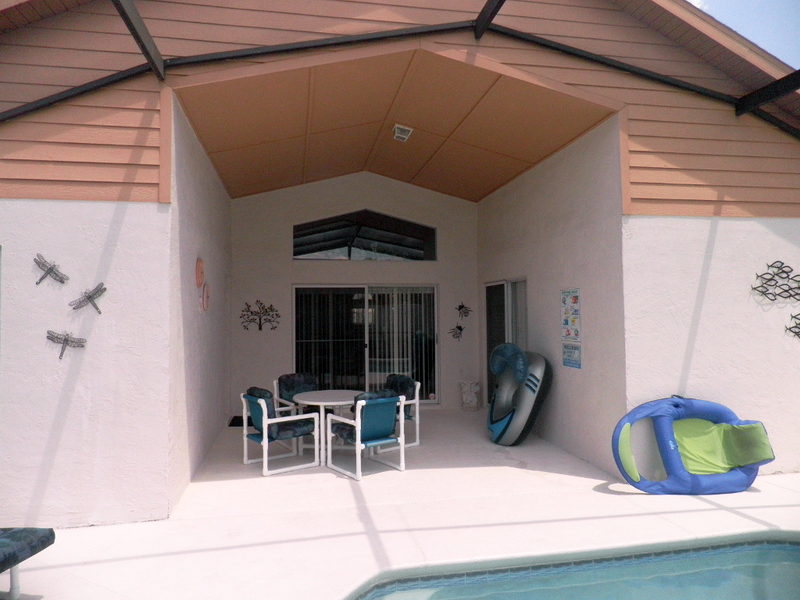 4 bedroom, 2 bathroom villa in the Indian Point community. Owned by Sarah & Wilf Yates. Ref: 950. Free wireless (wifi) Internet access. LCD HDTVs with Builtin DVD in ALL bedrooms & Playstation-2. Complementary Local,Long Distance + International telephone calls. FREE use of Crib/Cot,2 Strollers, High Chair, Baby Monitor & Bed Rail. For privacy reasons, the marker on the map shows the Indian Point community location and not actual villa location. ++ Free WiFi Internet Access. ++ 42" WideScreen HDTV with surround sound, 400+ HD Channels. ++ DVD library 90+ movies. 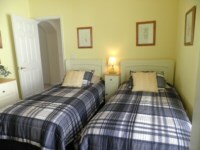 ++ Sumptuous 2nd Queen Bedroom + Twin. ++ LCD HDTV with builtin DVD with 76 HD channels, one for each bedroom. ++ Colouring pencils and crayons for our younger guests. ++ Large Selection of reading books. ++ Use of Baby Cot/Crib,2 Strollers,High Chair, Baby Monitor & Bed Rail. ++ Alarm Clocks in all Bedrooms. 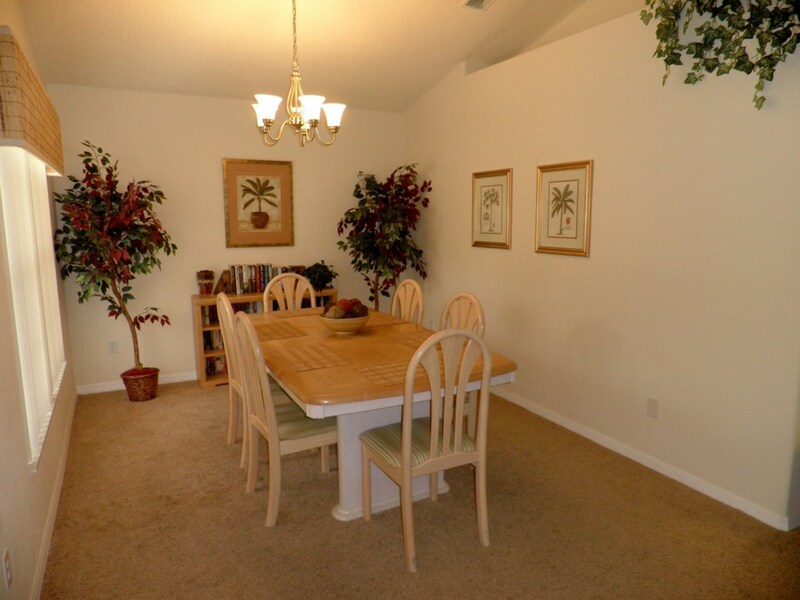 ++ Ceiling Fans in All 3 bedrooms. ++ Use of 3 Hair Dryers & curling tongs. ++ Iron + Ironing Board. 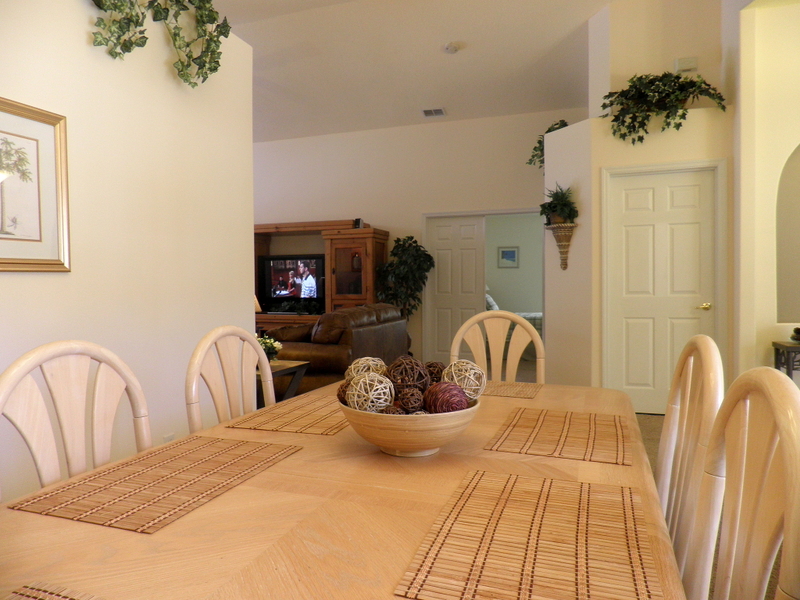 Our Fully Air-conditioned home can accommodate 10 people in comfort. 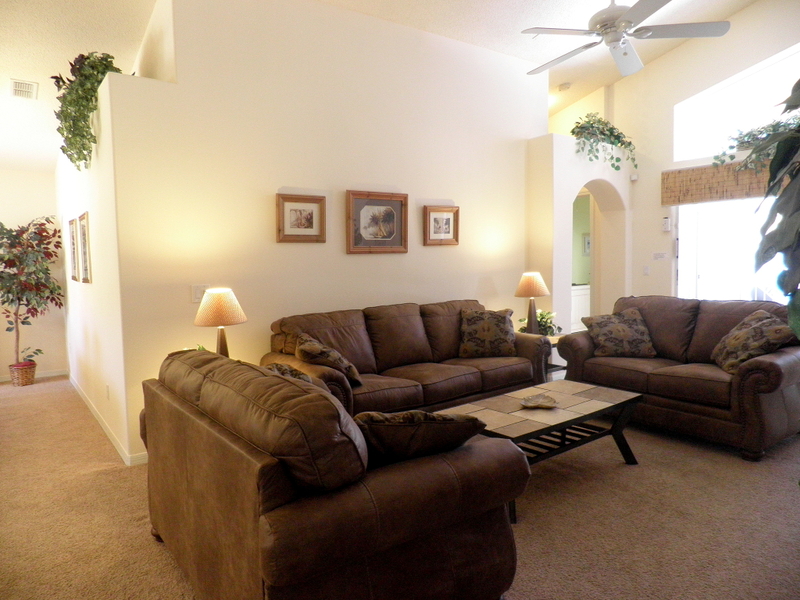 Family Room - Just back from a long day at the parks? , time to relax in our fabulous quality sofas and watch a multitude of programs on our high definition widescreen 42" HDTV with Panasonic 5 dvd changer + home theater Dolby surround sound. This TV has 400+ HDTV channels and premiership/uefa football for the UK footy fan. We have a growing library of DVD movies (90+) and books that you can use and for all, a PlayStation-2 with dual hand controllers with a selection of games. Also for our younger guests, we have a selection of board games + colouring pencils. For added comfort there is a remote controlled ceiling fan. 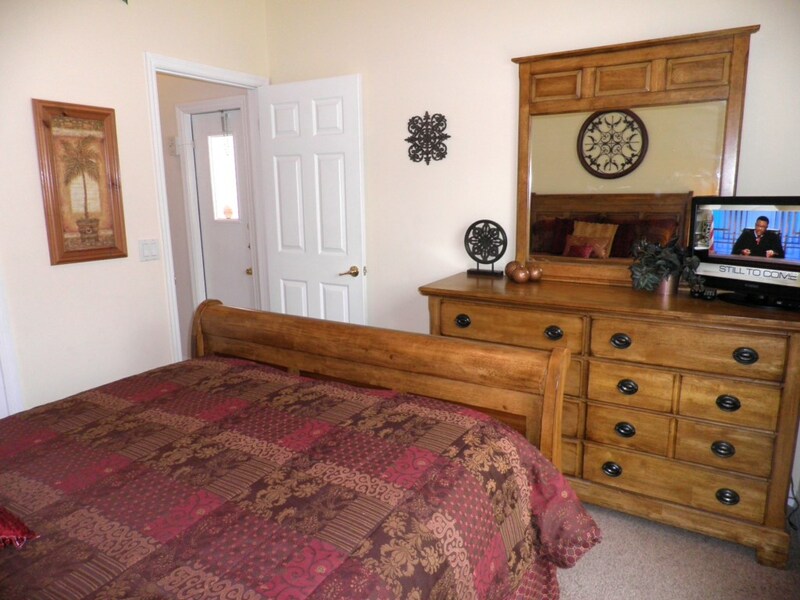 Master Suite - This bedroom has a huge 66"/2m King-size sleigh bed with sumptuous mattress, where you can watch the 76 HD channels on the 32" LCD tv. 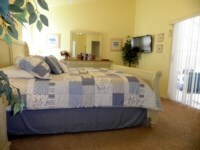 This suite has a matching dresser unit with mirror, 2 nightstands and its own direct access to the pool area. It also has a ceiling fan, alarm clock/radio and the answerphone can be found here with cordless telephone handset. En-suite Bathroom - The huge en-suite for the master suite has dual his n hers vanity basins, with very well lit mirror, a large walk in shower, separate WC and huge corner bathtub. A hair dryer is kept in this bathroom for your use. Storage aplenty with a large walk in closet. 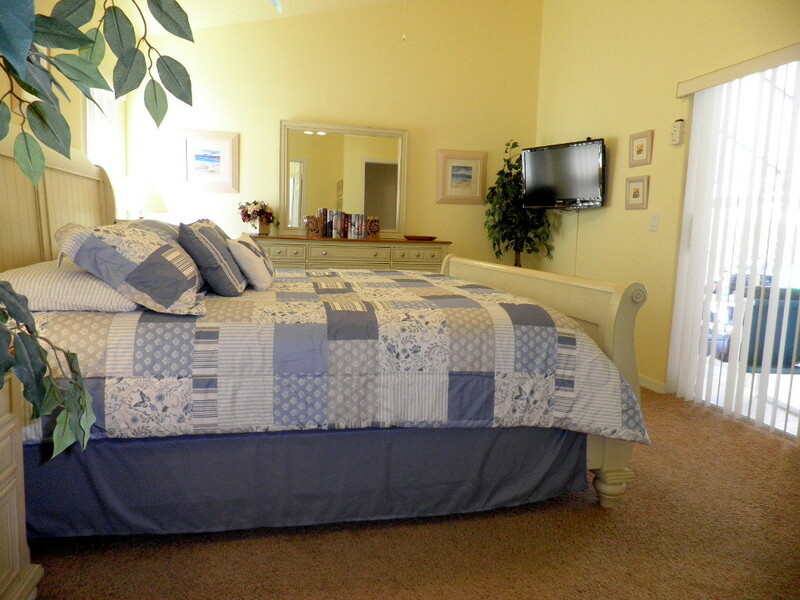 Queen Sleigh Bedroom - Overlooking the pool area, has a Queen (5/1.5m wide) sleigh bed with a sumptuous mattress, matching large dresser with mirror and nightstand along with LCD HDTV with 76 HD channels, builtin DVD player, Alarm Clock, Ceiling Fan and built in closet. 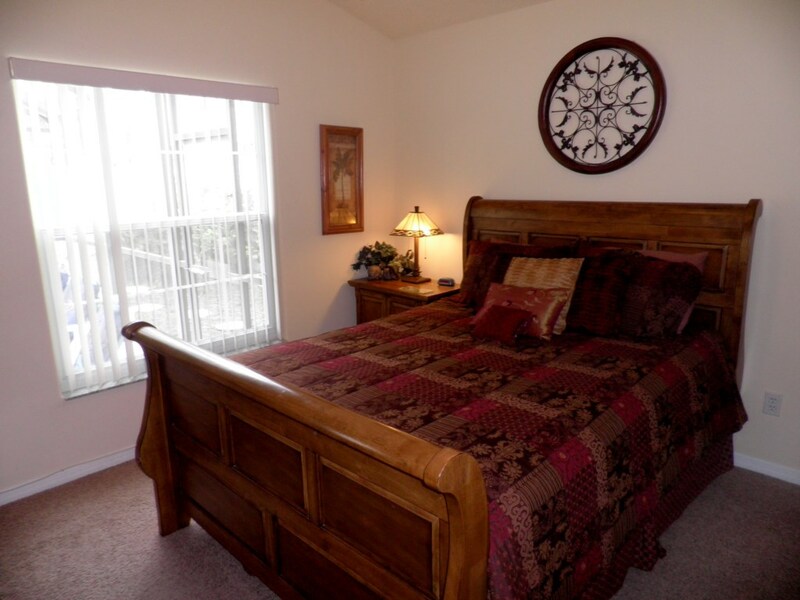 2nd Queen Bedroom - Also has a Queen bed with a sumptuous mattress, matching large dresser with mirror and nightstands along with LCD HDTV with 76 HD channels, builtin DVD player, Alarm Clock, Ceiling Fan and built in closet. Twin Bedroom - With "Winnie the Pooh" drawings , and along with LCD HDTV with 76 HD channels, builtin DVD player, Playstation-2, large dresser with mirror, Ceiling Fan, Winnie the Pooh alarm clock and a double size built in closet. 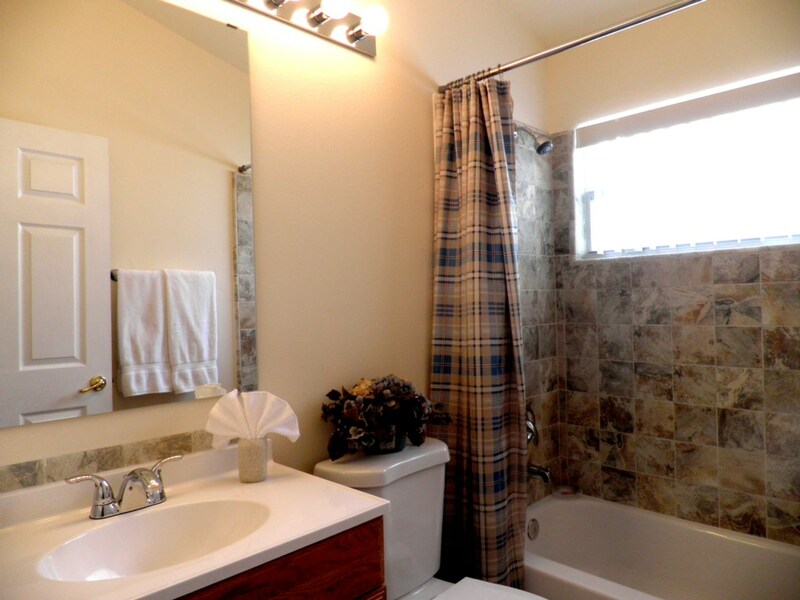 Family bathroom - Completely remodeled this year. 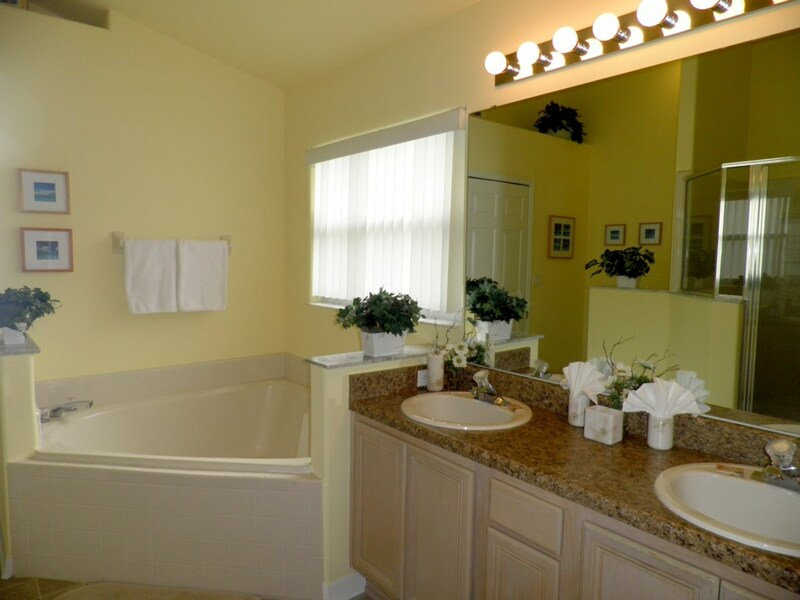 With vanity basin, well lit mirror, shower/bath tub, WC and hair dryer. All in easy access to the pool area. Baby Equipment - If you have a toddler we provide a free travel crib(us)/cot(uk) (with bed linen), 2 strollers, High chair and Baby monitor. For the slightly older child we provide a Bed Rail. Pool Area - The lovely heatable pool is west facing so the pool and lanai area catch the sun well into the early evening. To keep bugs out it is totally enclosed by a screen enclosure and is surrounded by a 66"/2.0m fence for Total privacy. When not enjoying the pool you can relax in the deep cushioned lanai furniture including 4 loungers. 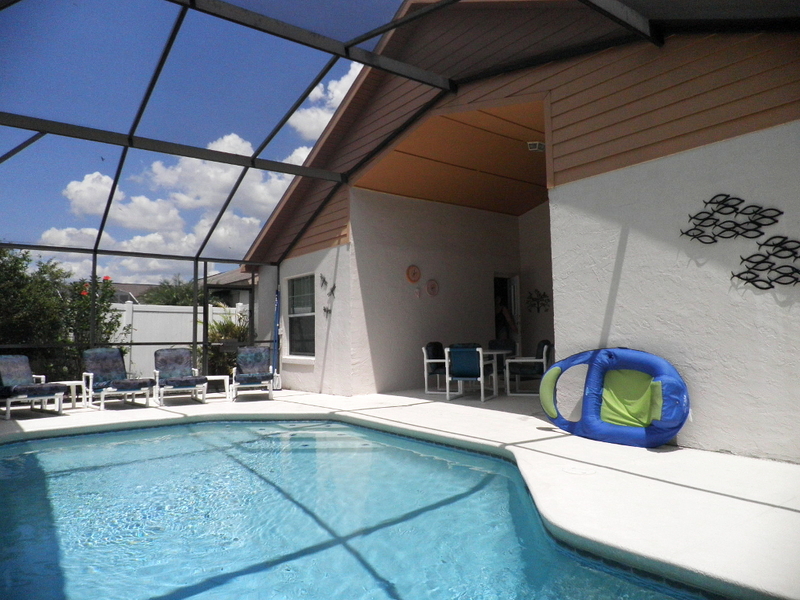 The pool is heated by gas for quick efficient heating for an additional fee. We also provide some inflatables for added fun. All access doors to the pool area are alarmed for child safety. 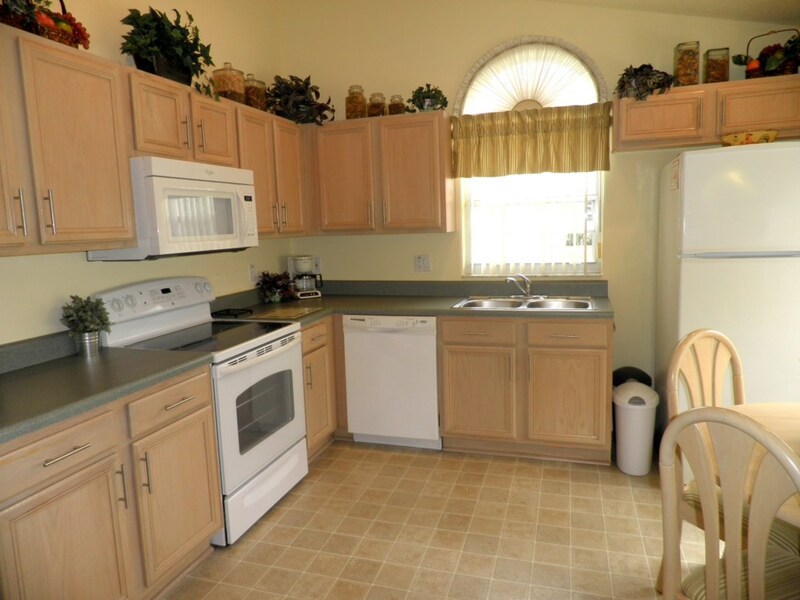 Kitchen - There are all the amenities that you would expect in the kitchen. Brand New Electric Oven & Hob , Microwave , DishWasher , Fridge/Freezer with ice maker. Also 4 Slice Toaster, Coffee machine, Blender , Waste Disposal. Crockery , Utensils etc for 10 people. Another cordless telephone for your complementary local, long distance and international calls can be found here. Dining - There is a formal dining area with award winning Fruit Bowl display (Please do not be tempted to eat the fruit, like one of our guests!) and a breakfast nook for additional seating. Laundry Facilities - Brand New Large size Washing machine and Tumble Drier. Along with Ironing Board and Iron. Garage - To save flexing your muscles opening the large double garage door, we have installed an electric garage door opener, we supply an access code for opening from the outside. 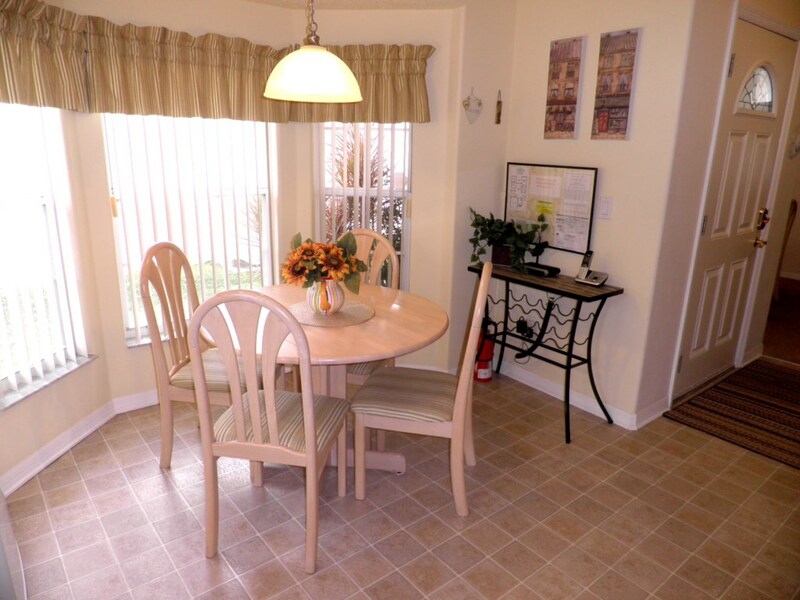 Location - Indian Point - This community is nice and quiet with easy access to all the attractions you wish to visit being centrally located for the theme parks. The US-192 road is a short 2 minute drive away, packed with restaurants, bars, shops, and all manner of small attractions for investigation. The evening dining attraction Medieval Times is a 10-15 minute walk away, should adults want to enjoy a drink or two and not have to worry about driving. 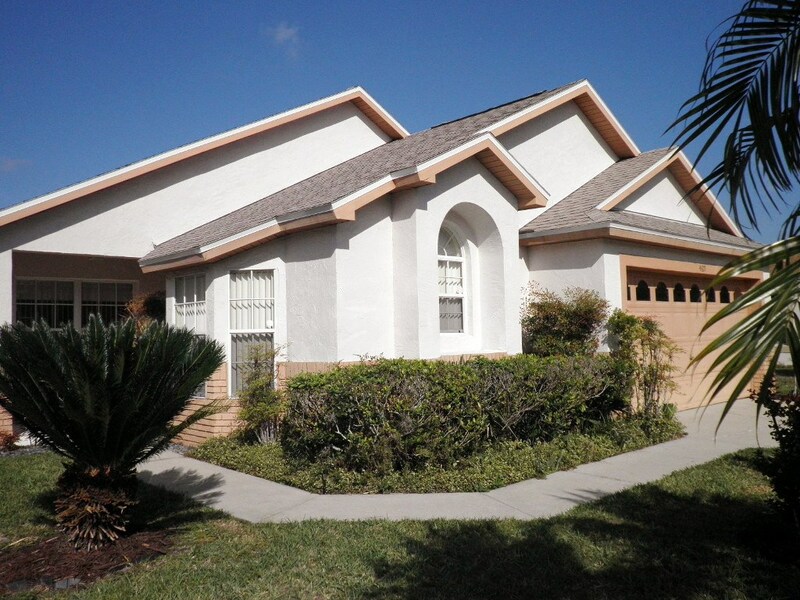 Interstate 4 is a 10 minute drive away for easy access to Busch Gardens (75 Minutes), Tampa and beyond. The car hire lot at Orlando Airport is a 27 minute drive. Car Hire + Theme Park Tickets. - If you need any information about Car Hire and Theme Park tickets we will be more than happy to assist. The best recommendation we can give is that we have used the companies before and the prices for both car hire and tickets are the best weve found. No Smoking + Pet Free Policy - For the benefit, safety and comfort of all our guests, Smoking and pets are not permitted at our villa. Safety - For all of our guests peace of mind, All access doors to the pool area are alarmed for child safety. Every room has a smoke alarm, including carbon monoxide detectors, and there is a fire extinguisher in the Kitchen. We also provide 2 security safes for your personal possessions. * 18 Minutes to Sea World, Discovery Cove and Aquatica. * 20 Minutes to Universal Studios/Islands of Adventure. * 75 Minutes to Busch Gardens. * 20 Minutes to Orange County Convention Center. * 27 Minutes to Orlando International airport. * 10-15 minute walk to Medieval Times Dining attraction. Price per week - includes all taxes and utilities. Note We can only accept Euros if payment via paypal. Discount available for bookings of 21 nights or more, please contact for futher details. Your vacation can start and end on any day of the week. Payment accepted by US check, GB cheque, bank/wire transfer or Credit Card - Visa/Mastercard/American Express via PayPal. Average rating: 5.0 / 5 from 4 reviews. We all found Brillavilla to be absolutely perfect , the location was spot on being right off the 192 highway which has Walmart right on the junction where you join the 192 .I know this area very well and I was perfectly placed for the restaurants and shops I needed ,Disney is only 10-15 mins from the villa .The villa itself is so well stocked and the owners have thought of everything ,we had 3 small children and brought many things with us but baby items such as a stroller a cot and high chair are all supplied , all the bedrooms are extremely comfortable and the kitchen is like home from home with all sorts of things you don’t even know you need like Tupperware pots that I used for packed lunches for the babies .I will not hesitate to use this villa again a very enjoyable stay . Beautiful villa equipped to meet every possible need and perfect for a family or larger group of people. 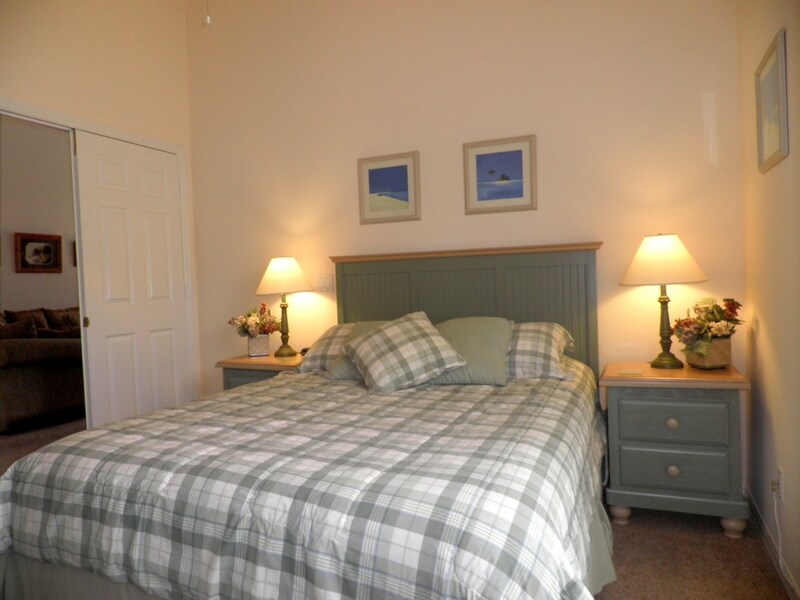 Great location, very close to a wealth of amenities and in good reach of the parks. The owners responded immediately in answering any questions, queries or concerns and were supremely thorough and professional throughout our correspondence. Everything was perfectly organised, instructions and information clear and easy to understand. We would like to return in the future to this lovely home. This is a lovely villa. Very modern, extremely comfortable and very clean. 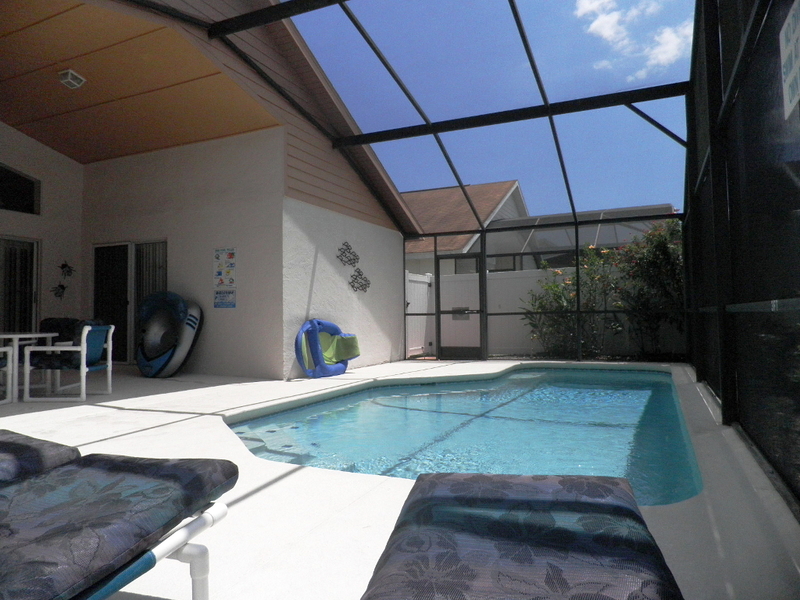 Pool is excellent and villa is in a great location for all that you would want to do in and around Kissimee. 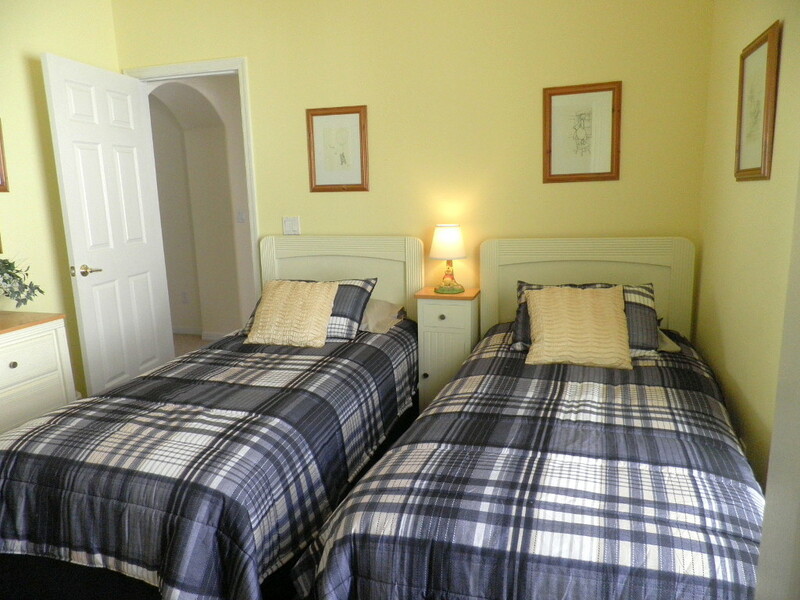 Great location for a wonderful holiday home, everything you could want and more. The villa was well equipped and very clean. Would definitely recommend and hope to visit again sometime soon! A wonderful holiday had by all - thanks Wilf. Your enquiry will be sent to villa ref 950 only. e.g. 19 April 2019 is 19/04/2019. This page has been viewed 59938 times since 07 Oct 2003.